Those of us with a little chocolate hazelnut spread addiction will be happy to celebrate World Nutella Day. Read After the Wreck, I Picked Myself Up, Spread My Wings, and Flew Away by Joyce Carol Oats. This week we celebrate Children’s Book Authors and Illustrators week, and I’d like to use the day to talk about an author whom I have admired for more than forty years. As a young Horn Book assistant editor, I read the galleys of the second children’s book by Susan Cooper, The Dark Is Rising, and I became her fan for life. 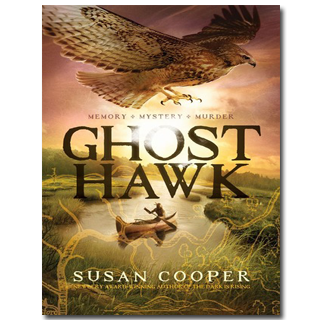 Last year Susan created one of her most ambitious novels to date, Ghost Hawk. In it, she sets out to capture four hundred years of the history of an area north of Plymouth, Massachusetts, where she now lives. To do this, she begins her saga with its first inhabitants, the Wampanoag Nation, and follows the journey of a young boy, Little Hawk. Then the colonists arrive, and another young man, John Wakeley, takes center stage. Later this historical fantasy moves through King Phillip’s War to modern times. The plot is so rich and multilayered that I will not even attempt to summarize it here—it is best experienced simply by reading the book. As I savored the first few chapters, I became aware of how rarely, in recent years, I have read such an excellent novel in terms of literary craft, all in the service of story. Little Hawk’s journey in the first section of the book rivals Hatchet as a survival saga. In recognition of that craft, Ghost Hawk has just been placed on the long list for Britain’s Carnegie Medal. I’ve had wonderful reports from fifth grade teachers who are reading the book aloud. The entire story naturally lends itself to spirited discussion for teachers, parents, children, and even college students. I am so grateful that we have writers of Susan’s accomplishment, working to craft the best possible books for children. Rather than rest on her many laurels, she has continued to write, explore ideas, and take risks. So for Children’s Book Author and Illustrator Week, I just want to say, Bravo Susan Cooper! Thank you for more than forty years of thoughtful, brilliant books written with an understanding of the subtleties and cadence of the English language. Thank you for continually being a voice for literary excellence. With your pen you have not just created children’s books—but children’s literature. He had left his canoe in the river, tied to a branch of a low-growing cherry tree. Now there was green marshland ahead of him, all round the river’s last slow curve. He pushed his way through waist-high grass toward one of the three high places in the marshland, where trees grew. They were islands of trees, never visited; the duck hunters went only to the marsh. He had chosen this place months ago, and now was the day to come back. In a squawking flurry two ducks erupted ahead of him, flying low, but his boy stayed on his back; he would not hunt till later, on the way home. He reached the trees – a tangle of pin oak and cherry, sumac and hickory, juniper and birch – and threaded his way through the grabbing branches to the two rocks that marked the tree he had chosen. There it still was, beside the rocks, still the proper shape: the small butternut hickory tree with its twin leading stems growing in a slender V.
Originally posted February 5, 2014. Updated for . After that book, I became Susan Cooper fan for life as well. There are several ways I can easily interpret The Dark is Rising as having threads through my early life, and any author that can do that, has a dedicated customer. Goodnight Mister Tom, Secret Garden, etc., etc. Many new (and old) children’s books will always get a smile from me just thinking about them. However, a new book from certain authors actually gets me excited. Anything new from Susan Cooper will get me running to a book store. Can’t wait to get hands on Ghost Hawk. Without your endorsement, I probably would have let this book go by, but I am so glad that I saw your entry and waited to get the audiobook from the library! Strangely enough, the narrator is Jim Dale (of Harry Potter fame) which is a little odd at first but soon just becomes another way to appreciate the story. I finished listening a while ago, but am still thinking back to the story and the power within. I don’t know of many books that have Wampanoag characters nor give such an honest view of the Puritans and of King Phillip’s horrific war. So glad to see “Ghost Hawk” on your pages – wonderful book.